Home » Services » Opencart Extensions » Rich Snippet Extension / Plugin for OpenCart ecommerce Shops. 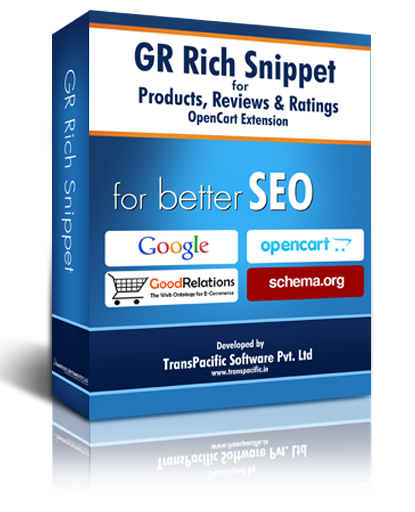 Rich Snippet Extension / Plugin for OpenCart ecommerce Shops. Installing GR rich snippet extension will display actionable info with your search results e.g. Reviews, star rating, cost. (Refer to below image) With additional info displayed; it is expected to improve search engine visibility, CTR, ranking and conversions. At last estimate more than 1000 (and counting) OpenCart shops have installed GR Google Rich Snippets. Most of them are experiencing increased CTR due to better representations in search results with star rating, breadcrumbs trail, reviews and pricing. We do Free of cost custom installations. It's absolutely necessary to maintain the Rich Snippet data on your shop for atleast 30 days to see results on Google search. It takes time for Google bot to visit your shop and index the page along with Rich Snippet data. We suggest regularly re-submitting sitemap for faster indexing. I have added the snippet but I don't see star rating or review on Google results? Some site owners may try to spam fake reviews and star ratings. Don't do it as Google has sophisticated algorithms to pick up fake ratings and reviews. Once these fake reviews are picked up Google will penalize the site by demoting it. 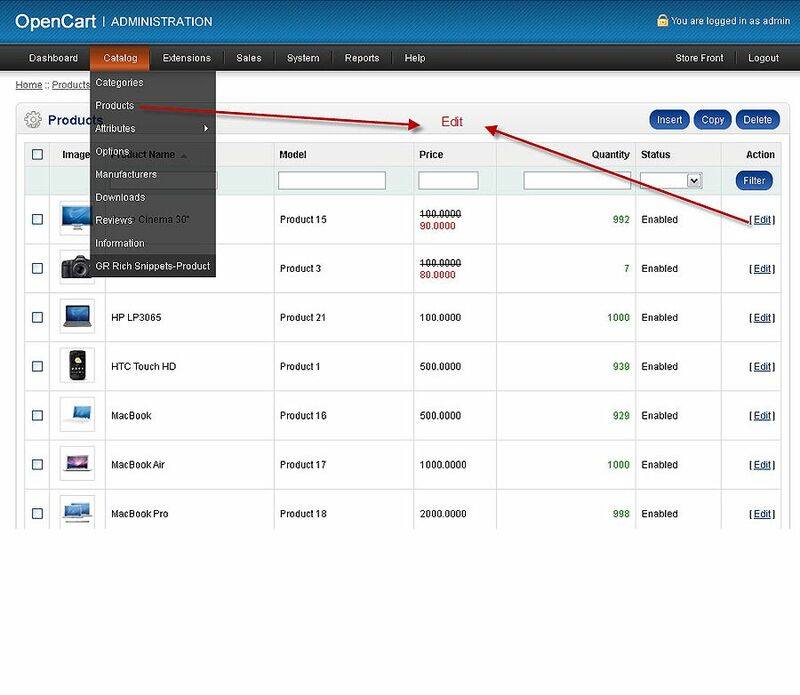 It's similar to how any other OpenCart extension is installed. 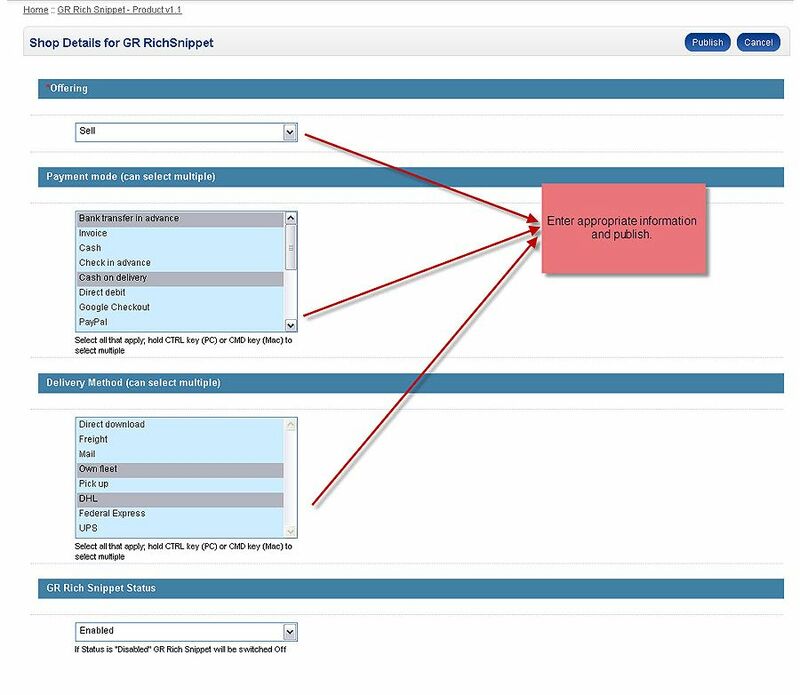 Copy the contents of the "upload" folder to your store's top level directory, preserving the directory structure. This will not overwrite anything as they are all new files. More generic tutorial is available on extension installation is available here. Make sure that you have VQMOD installed as the extensions based on VQMOD. Login to your store's admin. Fill up the information and Publish. You are DONE with installation and configuration. GR Rich Snippet - Products Reviews & Rating is running. What is the difference between GR Rich Snippet-Business Entity and GR Rich Snippet - products reviews and rating? GR Rich snippet-Business Entity embeds in home page rich snippet with information about your company, address, phone number etc. GR Rich Snippet- Products embeds rich snippet data about the product, product rating and product reviews on product pages. For best results embed both extensions to be installed. What are the pre-requisites for installing the Plug-in? The English translation file is located at "admin/language/english/module/richsnippetsproduct.php"
My OpenCart theme is customized? I need to remove "RichSnippet enabled" tag line appearing in the footer? We have invested hundreds of hours in researching and coding the extension we would appreciate if you may maintain the link. It is list obstructive to your design and placed at the footer. Still if you wish to remove it we will get it done for you on payment of USD50. I need Richsnippet enabled link removed as well as customized install? We would charge USD100. Customized installation will include installation and testing. How should I know that code snippet is correctly added? You will be able to see semantic data as read by Google bot. 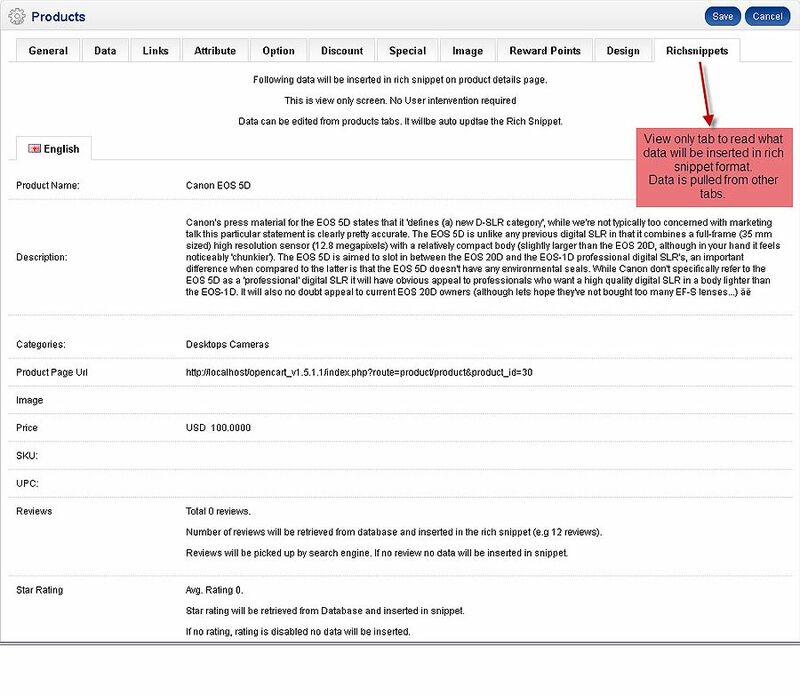 Apart from it you may view source to check semantic data embedded within the page. Google results are not displaying the results with microdata? Is GR Rich snippet adhering to Google Guideline? Will the snippet work on Bing.com & yahoo.com? vQmod is an override system. It is a layer above the OpenCart core functionalities. No changes will be made in any OpenCart code. 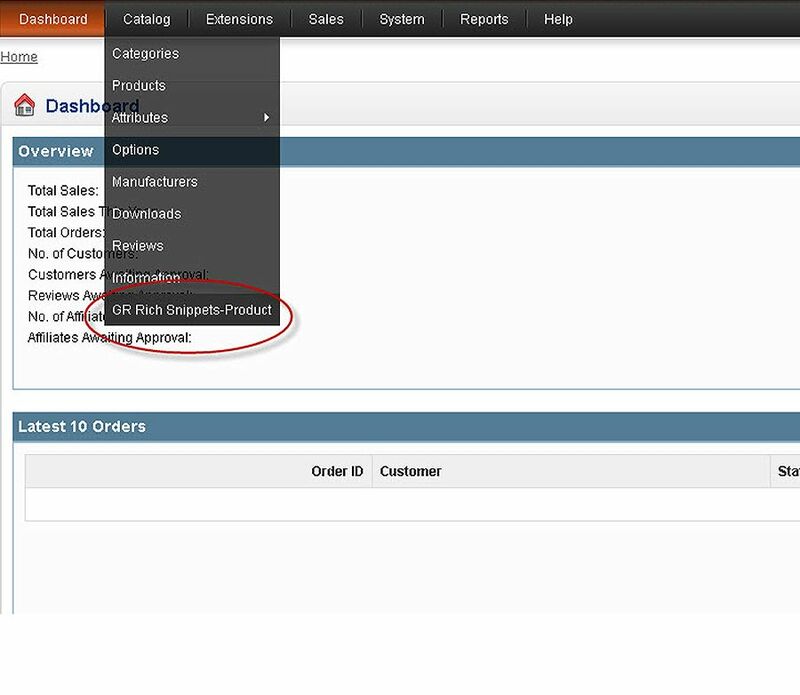 The extensions are coded to handle default OpenCart installations as well as customizations to some extent. What info will you need for customization? Your site URL, FTP details and OpenCart Admin details. We will only change code in GR Rich Snippet Extensions. NO change of any nature whatsoever will be made in your Open Cart installations or any other plugins. What about security in parting with passwords? Don't worry they will be confidential. You may change the passwords as soon as we complete customization. We are an established company with hundreds of clients worldwide. So please be rest assured on this front. What will be the cost of customization? Anywhere between USD25 to USD40 one-time cost depending on level of customization. Would it be tested after customization? Yes we will test it on Google Rich snippet testing tool and ensure that rich snippets are correctly nested in the code. No down time. The work will be completed in 1 working day.